EDIT: Around 20 mins (as of 11:49 PDT) after I posted this the rooms have been pulled. That was fast! 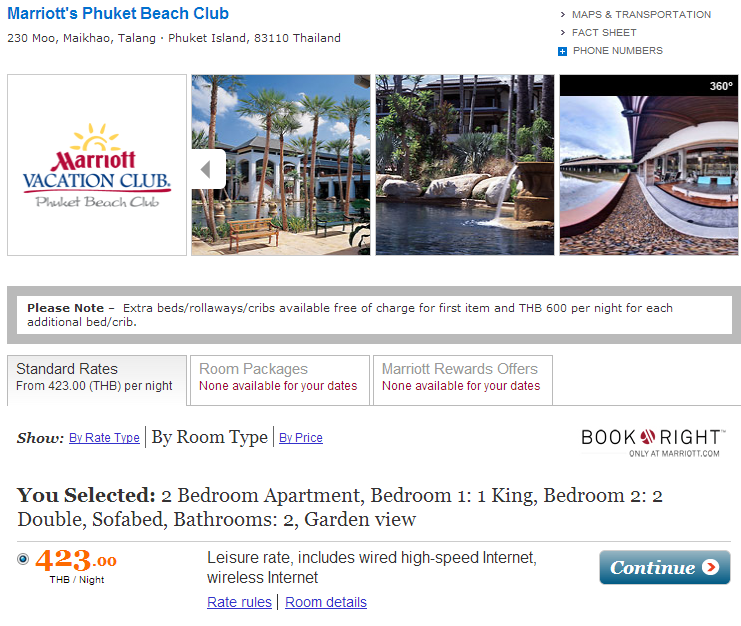 Marriott Phuket is pricing rate at 423 THB, which is a currency error, because 423 THB is approximately 15 USD. If you are planning a trip South Asia, book now and cancel later. Definitely a steal! This is definitely a mistake fare, so it will be pulled very soon! I have not (and likely will not) book this so I don’t guarantee that your reservations will be honoured of course. In the event the hotel does honour it would be very cool to stack it with the Unexpected Bonus Promotion. Full prepayment required 24 hours after booking. Changes or cancellation not permitted. You can also file a BRG with any other OTA’s if you’re feeling adventurous to get an even better deal. Very glad I found this gem on flyertalk just before I was going to sleep. Big HT! whatever you save on the room will be eaten up with tuktuk and taxi fares.